"Love Locks," "Walking the Dog,"
"A Dash of Love," "While You Were Dating,"
"Love at First Glance," and "Love Blossoms"
Which Movie truly warmed your Heart? 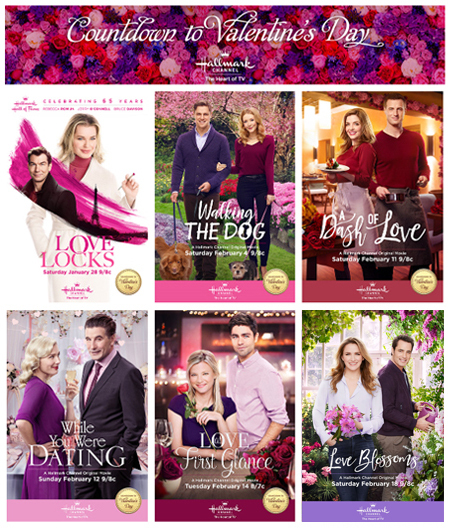 Hallmark officially premiered FIVE NEW MOVIES as part of the Event for *Countdown to Valentine's Day*: "Love Locks," "Walking the Dog," "A Dash of Love," "While You Were Dating," and "Love at First Glance!" Technically, "Love Blossoms" was not included in the Countdown to Valentine's Day movies, but since the storyline was based around the holiday, and since it premiered just a few days after Valentine's Day - I'm squeezing it into this category, too! 1. Which "Countdown to Valentine's Day" movie did you like/love the most? 2. Which "Countdown to Valentine's Day" movie poster (above) do you like best? Looking forward to hearing all your responses!!! Was there one, you didn't particularly love? Feel free, if you like, to briefly share your thoughts on all the *Countdown to Valentine's Day* movies!!! Walking The Dogs with Love Blossoms a close second. I liked the Love Locks the most. First and foremost, I would like to thank you for all your efforts you put into you blogspot. I have enjoyed it for quite a few years. As for my favorite Valentine's Day movie, hands down "A Dash of Love", I absolutely loved the story line and the acting in this movie. As for the poster, the same and "Love Blossoms" comes in second. While You Were Dating -- I thought the writing and acting were quite good in While You Were Dating. It was a nice, breezy-but-not-overly-sweet rom-com, and I loved the "photo sharing website" angle. A Dash of Love -- I thought that Jen Lilley stole every scene she was in during A Dash of Love. The camera loves her. I would be shocked if Hallmark doesn't try to lock her down for more movies, especially a Christmas movie, as she fits perfectly into their family of actors. Walking the Dog -- A good cast, lovely scenery and very expressive dogs. I didn't dislike any of the others, and Love Blossoms earns points for filming in Belgium, but I just liked them less than the 3 I mentioned. I wanted to like Love At First Glance more than I did (the scenery was good in that one too), but it felt more like a movie that should have premiered on Hallmark Movies & Mysteries than on the main channel. I am one of the few people who actually prefers the movies on the main channel over the movies on HMM, so if something seems a little too serious or too thought-provoking on the main channel, instantly I feel like it should be on HMM. I felt that Love At First Glance was trying too hard to be deep and meaningful (as Amy Smart's character 'found herself' and learned to step outside of her comfort zone and take chances) -- and I don't want to go deep and ponder the meaning of life, happiness and all of that when I am watching a Countdown to Valentine's Day movie. I just don't. I want more lighthearted fare on the main channel, which is *usually* what is offered. I'm not sure about the posters. I *guess* I like the Walking the Dog poster because the dogs (with the super-expressive faces) are included in the picture, and I love the beautiful trees and flowers in the background. I have a heard time picking one that I liked the most. I feel like five were pretty close with one that I didn't enjoy. While You Were Dating- Being older myself, I like the "older" cast. I could relate to the online dating aspect as well as being a photographer. Love Locks and Love Blossoms-Scenery beautiful. Walking the Dog- Loved the animals! All of the above are about on the same scale and I enjoyed them all. Love at First Glance I did not enjoy. It was so gloomy for the most part. I didn't like it being so gloomy on the Valentine's Day. I mean I want V-D to be pretty cheesy and happy! I also thought there was not enough time for the two leads to spend together. They barely had a conversation and although that's not the point of the movie, I still feel like the leads need to be in each other's presence. Love Blossoms for both movie and poster! The absolute, runaway favorite for me was "A Dash of Love." It's my favorite of 2017 so far (not counting HMM series). Really loved the story. I also really liked "While You Were Dating." I enjoyed all the others, particularly "Love Blossoms" (big Victor Webster fan), but they didn't stick out as much as the aforementioned. As for favorite poster, I'm going to have to give that to "A Dash of Love" as well. It's probably because of all the pretty red. My favorite color is dark red. "A Dash of Love" is the clear winner! Great chemistry, unique love story. Gotta love Jen Lilley in this! Her spirit shines through and she made her character very likeable. I thoroughly enjoy this from beginning to end! #1 Walking The Dog because watched twice!!! #4 Love at First Glance least favorite of all because they was only in 2 very short scenes together. #1 Love Locks really like it!!! Simple but yet so different from the others. My favorite movie and poster was "a dash of love". The best movie is- since we're only supposed to choose one, I'll say it was a tie for me between Walking the Dog and A Dash of Love. Best poster is Love Blossoms. I would've picked A Dash of Love, but it's a little too dark for me. None of the "Countdown to Valentine's Day" movies were my favorites this year. Some were mediocre and I'll probably watch them again, but not any true favorites this time around. Love at First Glance was the biggest disappointment for this "Countdown to Valentine's Day." The story and actors were good, but as a love story it fell flat right on it's face. That's just my take. Thanks for covering "Countdown to Valentine's Day" for us, Net. I love what you do here. I choose Walking The Dog as my favorite for both questions! Ohhhh, Net, I just can't choose between Love Blossoms and Love Locks because I loved, loved them both and Love Blossoms for the poster. My favorite movie for the Countdown to Valentine's Day is a tie between "A Dash of Love" and "Love Locks." The movie poster that I liked best is "Walking the Dog"
I liked all of the Countdown to Valentine's Day movies the same. No standouts to me. All were good, not great. My favorite movie was Love Locks. My favorite poster was Walking the Dog. If it's Hallmark, I generally love them all. What a cute blog!!! I love movies/mysteries, on both Hallmark Ch.!!! I feel in love with interior shots, which were supposed to be in an "old boutique hotel" , in "Love Locks." The interior sets!!! Oh my!!!! Didn't care for the fake-ish Paris scenes. Come on, where are the armed military? We were in Paris, way back in 1999, and there were armed military around back then. With all the terrorism in Paris, there have to be many, many more now. And nary a one, can be spotted, in those Paris scenes. ???? Come on!!!! But the supposed to be interior sets... Loved them!!!! I only saw three movies in this particular line-up; “Love Locks”, “Love at First Glance”, and “Love Blossoms”. Out of those three, I liked “Love Locks” the best! I felt like this movie was the first step in the Hallmark Hall of Fame movies going back to the greatness they once were by returning to their roots and focusing on telling a good story. It just edged out “Love at First Glance” for me, even though I liked the creativity of the story in “Love at First Glance”. I tried to like “Love Blossoms”, but it just felt like a rehashing of other Hallmark movies that I’ve seen. The poster for “Love Locks” is my absolute favorite! It’s not only the best poster out of the Valentine’s Day movies, but for the whole year (so far)! What makes it so great is that it’s creative and unique, standing out amongst the other posters. Makes a great poster and a DVD cover! I enjoyed all the movies in Countdown to Valentine's Day - I thought they were a step up from Winterfest - although there was no absolute blockbuster. By a short whisker my favourite was A Dash Of Love, it was much better than the plot suggested, with Walking The Dog second. Brendan Penny and Sam Page are "must watch" actors! Love Blossoms was good too and I liked While You Were Dating more than I had thought I would. ove Locks was just a bit dated for me but still enjoyable and as others have commented there really was too little screen time together for the main characters in Love At First Glance. It certainly was something different for Hallmark but I don't really think I'd like to see them go in this direction. It was almost as if they had only just met at the end and would have needed some filling out. I thought they all had a feel good voice. I liked Love Locks the most and the best posters are Love Locks and Love Blossoms.